idbi federal | Follow The Fact! Get covered for life, carefree! Bucket lists. Man do I have a thousand of those! Since the day I started to talk and things around me started making sense to me, I’ve been thinking of what I’d do in my life. And I am not just talking about how I wanted to become a big doctor or a great engineer, I am talking the crazy stuff…! How I wanted to swim across the English Channel crazy! Every one of us has wishes he or she can’t fulfil because of the circumstances, but what if there was no restriction? What if it was only you and your dreams and no one to stop you from achieving them? Sounds like yet another unachievable dream, I know; but to think about it, it isn’t much difficult. I just came across this line “Befikar, Umar Bhar” (Meaning: Carefree for life) by IDBI Federal and it made me think; Most of us are doing what they are doing because this is what they could manage in their situation. Ask yourself, would you be doing this same thing if every problem and restriction in your life was removed? I don’t think so. Here’s 5 things from my bucket list that I’d do if I was ‘Befikar, umar bhar’. I know, I do it right now too. But this isn’t enough. If this restriction of money was removed from my life, I’d probably live with my family in an isolated place and write. This is one very achievable dream for me and I hope that I’ll make it happen one day. If you are a person who can travel to any place alone, there’s pretty much nothing left in the world that you can’t do. Those words aren’t mine, but I share the sentiment. Travelling can teach you a lot of things; How to self-reliant, how to be confident, how to stay healthy, how to cook and what not… it widens your perspective and improves your personality. ‘Only if I had enough time!’ is what everyone’s excuse is when they’re asked why they don’t travel as much. They’re not wrong. But if there was no constraint, I’d pack my bags and leave for the remotest places in a breath! It is easy to learn how to play guitar or maybe a new language while you’re doing a full time job. So obviously when I say ‘new skill’ I’m not talking about that. I’m talking about the crazy stuff. Trekking, mountaineering and stuff like that. There’s a little part of me that just wants to take a bike and a backpack and not stop till I reach the Himalayan ranges! As awesome as it sounds, it needs a rock solid planning and not to mention a lot of time. I plan to do this someday. I really do. But when that day will come is a fact that’s still unknown to me. When you teach, you multiply your knowledge and make a smart individual who will then go on and make other’s lives better, thus, helping your nation a great deal. Till now my teaching has been limited to a few kids and sometimes in NGOs. But I do see myself building a school that’s free for all, someday. 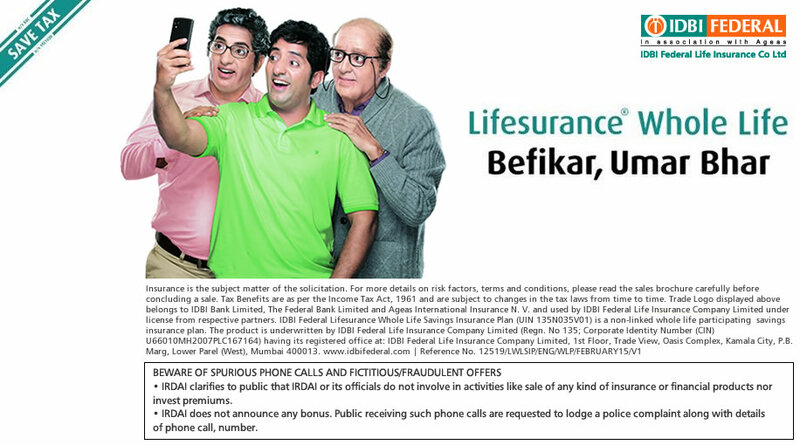 Get insured for life, cover yourself good! All those things, although sound too awesome, can be real difficult to do when we’re bound with the responsibilities of life. And that’s where a little planning may come in handy. Most of us do all those things for personal and financial reasons, and if we get at least one of those taken care of, doesn’t that solve a lot of our problems? As I began with the line by IDBI Federal, “Befikar, Umar Bhar”, it’s time to live it for real. Take a look at this video to know what I’m talking about.